She's not getting a bath, she just really likes to jump in there when Alycia uses the bathroom down in the basement. Shadowfax has never had a bath in this tub, so she possibly doesn't know what it's actually use is supposed to be, and therefore isn't appropriately afraid of the tub. What an adorable picture! 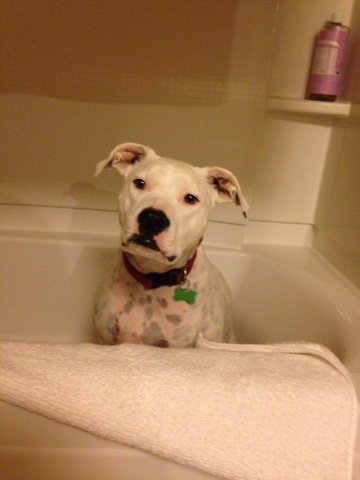 My dogs weren't too fond of tubs, but she looks right at home.